Do you like cakes? Pies? All the good stuff? Located in the corner of 13408 Stony Plain Road is... *drumrolls* HEAVEN for all the CAKE & PIE LOVERS of the world !!! I met with the wonderful Tiffany Claire of Click Heart Photography on a late Saturday afternoon. There were drools all over and a very indecisive tummy as I saw the selection of dessert that they had in store. My tummy was definitely doing a happy dance in there - they all looked mouth-wateringly-tasty! Decisions, decisions. On my side of the table, arrived the Blueberry Crumble Cheesecake & a Chai Latte. Tiffany had the Chocolate Pecan Pie. If my 30 year old body wouldn't hate me, I'd have a bite of everything. We sat on the pretty & instagrammable patio to enjoy what's left of the sun for a bit and then later moved inside... #patio #cakes #weekend. Would I go back again? You bet! "Life is uncertain... Eat Dessert First!" 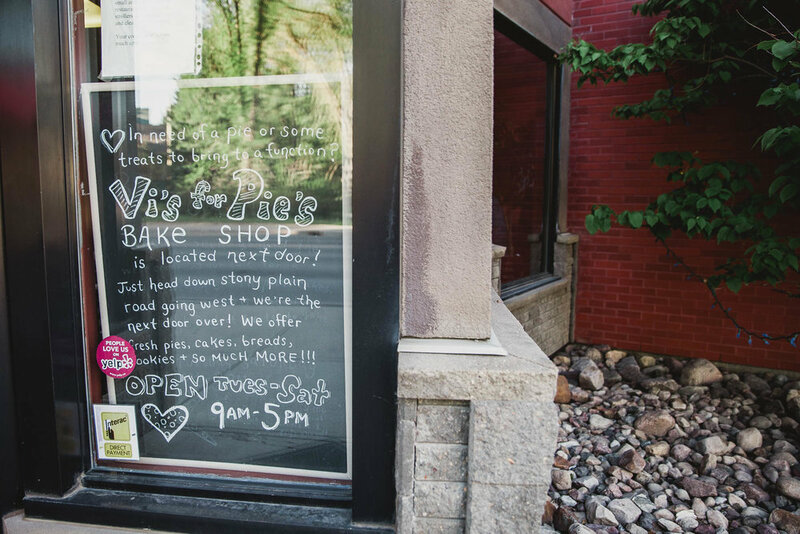 🍰Have You Been to Vi's for Pies? What was your favourite? I'd love to try it out! ❤️Unsponsored Post - Just sharing the good things in life!